The many different options of a Special Melee. The many different options of a Special Brawl. The many different options of a Special Smash. The many different options of a Custom Smash. Special Smash is a term that refers to several types of versus modes available in Super Smash Bros. Melee, Super Smash Bros. Brawl, Super Smash Bros. for Wii U, and Super Smash Bros. Ultimate. 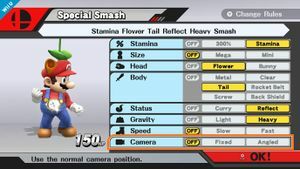 Although it does not appear in Super Smash Bros. for Nintendo 3DS, many of the Final Battles in Smash Run enable one of the options seen in Special Smash; additionally, voice clip 86 of the announcer in the Sound Test is of him saying "Special Smash", which may indicate cut or planned content. In all iterations through Ultimate, battles played in Special Smash do not count for statistics or the completion of some challenges. In Melee, Special mode is only played with one special condition at a time. 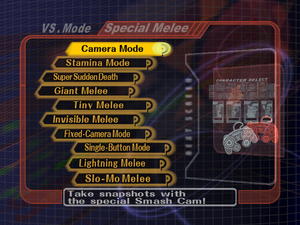 Unlike Melee's Special mode, where only one special condition could be played at any time, Special Brawl , Special Smash , and Custom Smash allow several options to be applied at the same time. It is possible to play without any options enabled, creating a normal match where statistics are not recorded. 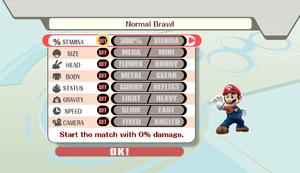 In Ultimate, the term "Special Smash" is not used for the mode itself, but for a sub-menu containing Custom Smash and the new mode Smashdown. The 300% and Stamina options are not present, but can be reproduced using standard match rules. While Special Smash is not available in online play, prior to version 1.0.8 a glitch in Super Smash Bros. for Wii U allowed playing online matches with friends under Special Smash settings. In Giant/Tiny Melee, though the effects upon collecting a Super/Poison Mushroom respectively will further intensify, the character's pitch will remain the same. In Brawl onward, pitch further lowers/raises. 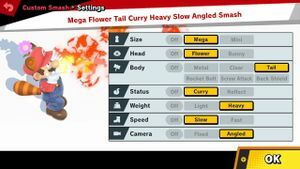 The largest a character can naturally become without cheating is in Mega Smash, after a lightning backfire. In this state, all size-altering effects are at their strongest, including character voices and sound effects being even deeper than collecting a Super Mushroom in Mega Smash, or after a lightning backfire in a normal match. This size can further be increased, though in an immovable state, by using Mario's up taunt (prior to Ultimate). The same applies to collecting a Poison Mushroom or Lightning Bolt (both shrinking to the same size) in Mini Smash. This page was last edited on March 27, 2019, at 15:18.